Whether it’s your first or your fiftieth, training well in advance is key for a successful half marathon. When I was in 2nd grade I ran my very first race. It was a 5K put on by the elementary school, probably as a fundraiser. I remember running the trail, grabbing cups of water, and finally finishing with a feeling of exhilaration. As the trophies were passed out, I knew I wasn’t going to get one because I was the last runner in. To my astonishment, and utter pleasure, I received the first place trophy for my age group – because I was the only one my age running! From there, my fate as a runner was sealed. Oh I tried other sports like Softball but found I really enjoyed the solo aspect of running, and not worrying that I would hold a team back. Really though, I just had no interest in other sports. Last spring I ran my very first half marathon. I never thought it was something I would do, because it was never something I wanted to do. 5K’s were plenty long enough, and adequate exercise. Then we moved to Indiana near my brother-in-law and his very active family. One of their favorite races is the Indy-Mini. 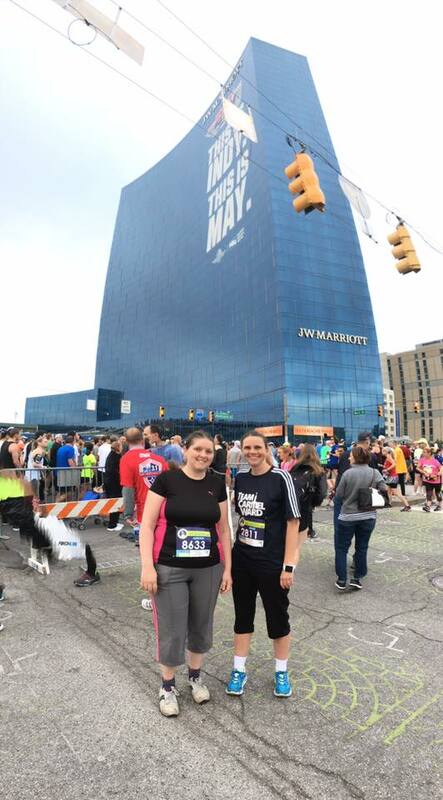 A 13.1 mile race in downtown Indianapolis. They convinced me that first year we were here to sign-up and run with them. I did, and then I postponed when we decided to have baby #5. There was just no way my body would be ready for that kind of distance. After Harold was born, I decided I really should start training for this half marathon, but I had no idea where to start. I turned to my Sister-In-Law for help. 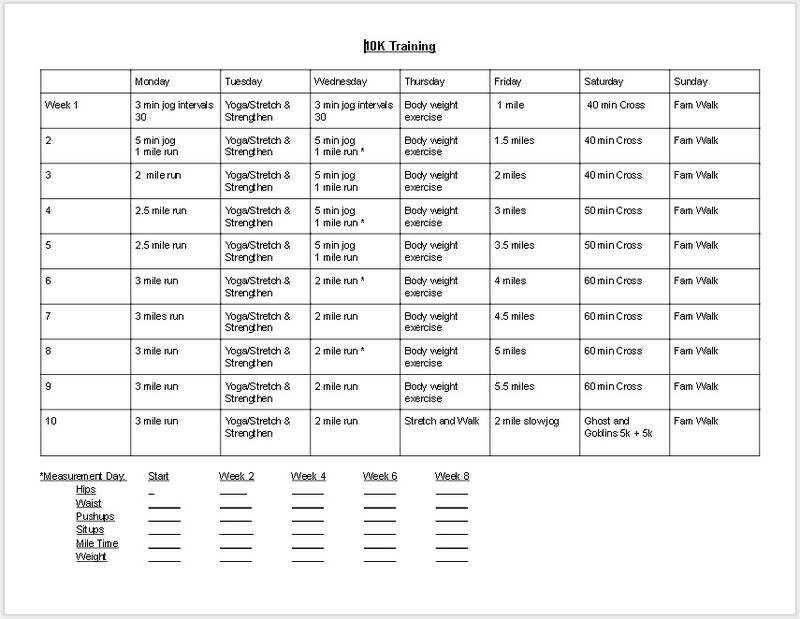 S She worked out a schedule that would increase my endurance and physical strength up to a 10K. You can download a copy of our workout for yourself. *The Ghost and Goblins 5K+5K is a local 5k race that we then added an additional 5k run onto after crossing the finish line. 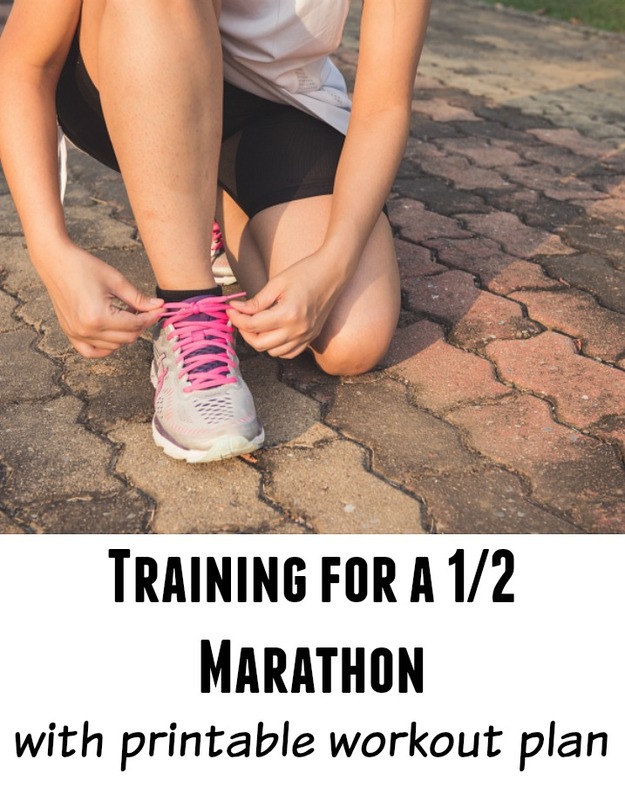 If you are fairly new to running and haven’t been out exercising much prior to your half marathon training, the first few days of interval runs I would say are crucial! I have always hated interval running, but as I had just come from 9 months of a hard pregnancy this was basically a couch to 10k training. Those intervals are what helped my legs strengthen and increase my stamina. After our 10k we took a small break during the cold months. We tried to get out, or at least head to the indoor track, but winter was well, winter. So with 6 weeks left before the race, we turned to Makeup Marathons for her training plan. It’s a great plan that closely followed our 10k training, with the big difference being we ran more miles leading up to the race. Good luck and happy racing! I’d love to hear your tips if you’ve run a half marathon!